Missing Washington Post columnist Jamal Khashoggi was killed in the Saudi Arabia Consulate in Istanbul, Turkey, the Saudi Foreign Ministry said on Oct. 19. An investigation into Khashoggi’s disappearance and presumed death found that the suspects, all Saudis, traveled to the consulate to meet with Khashoggi after it appeared possible that Khashoggi, a Saudi citizen who had been living in a self-imposed exile in the United States, could be convinced to return to Saudi Arabia. The suspects concealed what happened and attempted to cover it up. Eighteen Saudi citizens are being held in connection with the death. In addition, the kingdom announced that it fired five top officials, including Deputy Chief of General Intelligence Ahmad bin Hassan Assiri, a royal court adviser Abdullah Al-Qahtani, and Mohammed Bin Saleh Al Rumaih an assistant to the intelligence chief. A number of lower officials were also relieved of their posts. Saudi Arabia’s King Salman bin Abdulaziz Al Saud also issued a directive to set up a committee chaired by Crown Prince Muhammad bin Salman to restructure the country’s intelligence agency. “We are saddened to hear confirmation of Mr. Khashoggi’s death and we offer our deepest condolences to his family, fiancée, and friends,” White House press secretary Sarah Saunders said in a statement. President Donald Trump told reporters at a defense roundtable in Arizona on Oct. 19 that “people are not happy about what happened,” and noted how many people were allegedly involved on the Saudi side, including officials high up in the administration there. “This is a horrible event. This has not gone unnoticed,” he said. Trump said he would be open to punishing Saudi Arabia in some way but doesn’t want to cancel an arms supply agreement between the two countries, citing a potential economic impact on America. 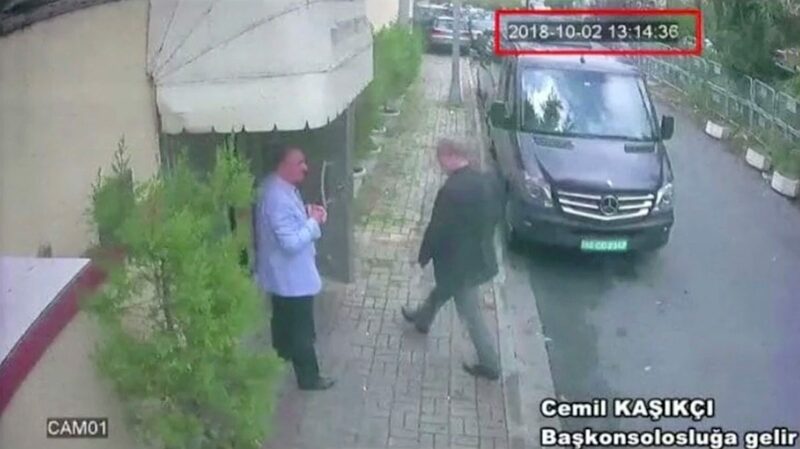 Turkish officials have claimed to have video and audio evidence proving that a team of Saudi agents killed Khashoggi in the consulate and then moved his body to a different, unknown location but have declined to show the evidence to either the Saudis or the United States, nor has it been made public. “I’ve heard no tape, I’ve seen no transcript. And the network that reported that ought to pull down the headline that says I have,” U.S. Secretary of State Mike Pompeo told reporters, referring to a report relying on an anonymous source that claimed he had heard an audio recording of Khashoggi in the consulate.